My Story card: Mrs Christine Bird remembers Malteasers running down the stairs. 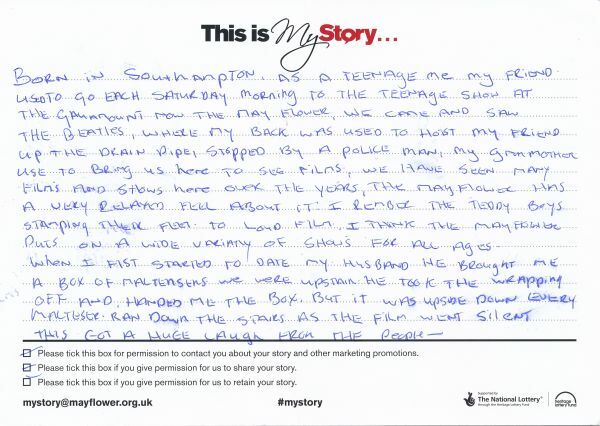 Born in Southampton, as a teenage[r] me [and] my friend used to go each Saturday morning to the teenage show at The Gaumont now the Mayflower. We came and saw The Beatles, where my back was used to hoist my friend up the drain pipe, stopped by a police man. My granmother use to bring us here to see films, we have seen many films and shows here over the years. The Mayflower has a very relaxed feel about it I [remember] the Teddy Boys stamping [their] feet to [a] loud film. I think the Mayflower puts on a wide variety of shows for all ages. When I [first] started to date my husband he brought me a box of malteasers. We were upstairs. He took the wrapping off and handed me the box. But it was upside down, every Malteser ran down the stairs as the film went silent this got a huge laugh from the people.